Interview with Jan Markell – Welcome to I Am a Watchman! Jan Markell was saved under Jewish evangelist Hyman Appleman as a child. 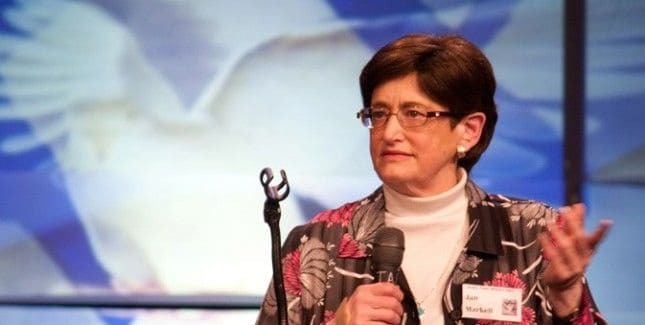 In Jan’s early ministry years, she was a part of the Messianic movement, worked for pro-Israel agencies, and for Jewish evangelism ministries. In 1982, Jan incorporated Olive Tree Ministries. Jan has written eight books and produced a dozen DVDs. In 2000, Jan launched a radio branch of the ministry called “Understanding the Times.” The program is now heard on over 830 stations across America. She also hosts a popular prophecy conference called Understanding Our Times. For more about Jan Markell and her ministry, visit olivetreeviews.org.